A North Carolina man got much more than a ticket after a traffic stop overnight on I-81. The Montgomery County Sheriff’s office says deputies discovered drugs and more than 35-thousand dollars in cash inside the vehicle. 25-year-old Kenneth Rowland of Charlotte faces multiple charges. News release: On May 1, 2018 Kenneth E. Rowland, 25 years old, of Charlotte, NC was arrested for Possession w/intent to Distribute Schedule I/II Drugs, Possession w/intent to Distribute Marijuana, Possession of Firearm w/Schedule I/II Drugs, and Driving Suspended. The arrest came after deputies of our office conducted a traffic stop on his automobile on I-81 in Montgomery County. Rowland was driving a 2000 Dodge Dakota when he was stopped for traffic related offenses in the Highway Safety Corridor of I-81 around midnight. 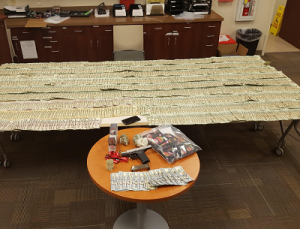 During the stop deputies discovered and seized drugs, a firearm, and more than $35,000 in cash that was located in the vehicle. 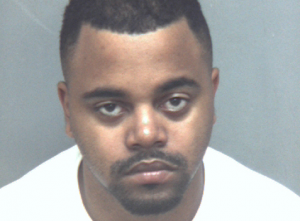 Rowland was subsequently arrested and is being held in Montgomery County Jail with no bond.